Rather than originating from a federal court of appeal like the majority of cases before the Supreme Court, the most discussed case of this term came from a state court. Masterpiece Cakeshop was petitioned to the Supreme Court after a decision from the Colorado Court of Appeals and Colorado’s Solicitor General, Frederick Yarger, handled the argument for the respondent Colorado Civil Rights Commission. As the highest Court in the land, the Supreme Court is the only appellate court to hear cases from both state and federal courts. This term, the Court heard arguments in seven other cases along with Masterpiece Cakeshop where the court below was a state court [the following links for these cases are to the lower court opinions: Cyan, Masterpiece Cakeshop, Artis, Collins, Currier, McCoy, Upper Skagit, and Wayfair]. Aside from cases that start in state courts, many other cases like the recently decided Murphy v. NCAA have vast implications for the states and state laws. Since many of the Court’s most well-known cases come from federal courts of appeal, however, cases where states are involved or that come from state courts can be overlooked. These cases play an incredibly important role in the Supreme Court’s annual docket and the decisions often have vast implications for state populations as well as for the nation as a whole. What types of issues arise in state courts cases that are later brought before the Supreme Court? To begin by examining a slice of these cases, the Court regularly reviews state courts death sentences. Along with the continuous stream of capital cases the Court reviews based on state courts’ decisions, the Court reviews a handful of such decisions on the merits. Some of these decisions drastically altered the practice of capital punishment nationwide in the past including the decision that halted practice, Fuhrman v. Georgia, and the one that reinstated it, Gregg v. Georgia. When we look at the capital punishment cases the Court has chosen to review on the merits since the beginning of the Warren Court in 1953, cases from several states in particular take up a disproportionate share of the Court’s 8th Amendment capital punishment jurisprudence (according to the United States Supreme Court Database’s coding). Several recent high-profile death penalty decisions came from Florida including the 2015 decision in Hurst v. Florida, which held Florida’s division of labor between judge and jury in capital cases unconstitutional. The court heard the second most cases from Texas, the state with the most executions over the past several decades. Cases involving state actors or beginning in state courts are not always as easy to locate as looking at a case’s title, especially when the party is an actor within a state. To this end, while eight cases came to the Supreme Court from state courts this year, 21 state government attorneys, mainly solicitors general, argued before the Supreme Court this term. That is an increase from ten last term and 20 during the 2015 term. As is apparent above, the lion’s share of state related cases over the past several terms originated in Texas and were argued by Texas’ S.G. Scott Keller. Previously mentioned Colorado S.G. Frederick Yarger along with Ohio’s S.G. Eric Murphy also argued a large number of cases in the Supreme Court between the 2015 and present terms. This term, for instance, Eric Murphy argued in NAM and Husted, Scott Keller argued in Abbott v. Perez and Texas v. New Mexico and Colorado, and Frederick Yarger also argued in Texas v. New Mexico and Colorado as well as in Masterpiece Cakeshop. While state attorneys occasionally participate in cases that did not originate in state court, the bulk of state government attorneys’ business in the Supreme Court began in state courts and was appealed/petitioned from a state court of last resort. When we look at the state courts that heard these cases before the Supreme Court since 1953, the most prevalent states tend to be the ones with the heaviest caseloads. The Court has heard many more cases that originated in California state courts and were appealed from the California Supreme Court or from a California court of appeal than cases from any other state’s courts. A large portion of these state cases also came from New York, Florida, Illinois and Texas with only a scant number from less populated states like Wyoming, Rhode Island, and Hawaii. 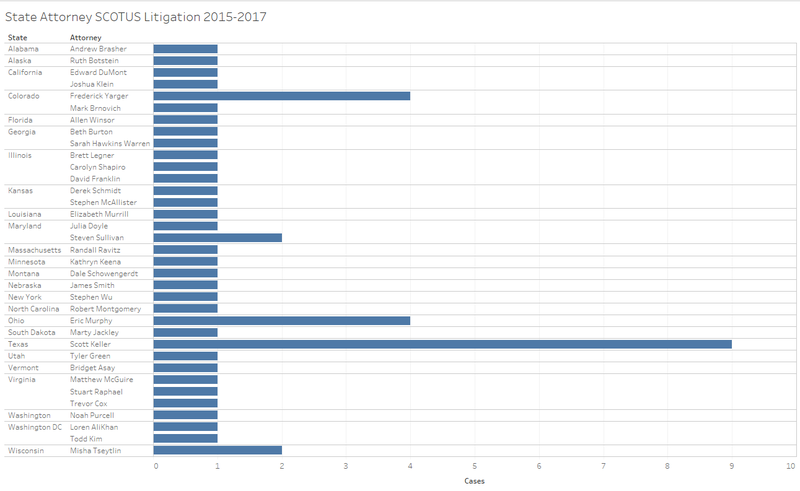 This look at the raw counts of cases from state courts misses the time element – specifically how frequently the justices hear such cases. 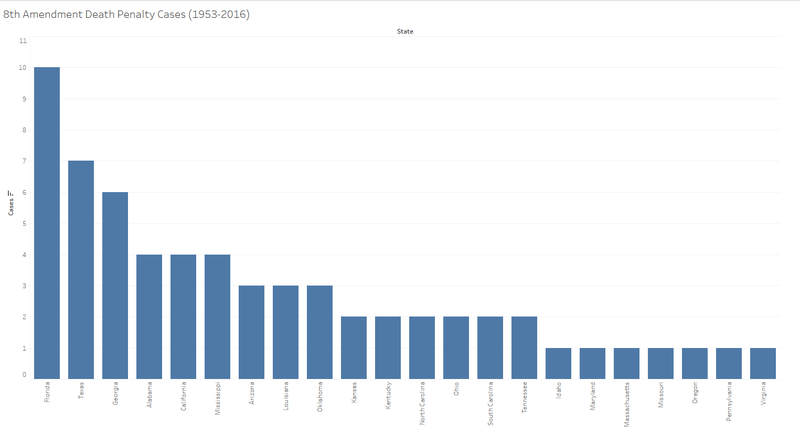 The next figure looks at the percentage of cases the Court heard after a decision from a state courts by term since 1953. The Court used to take a larger share of cases from state courts and this has been almost cut in half moving to the present. 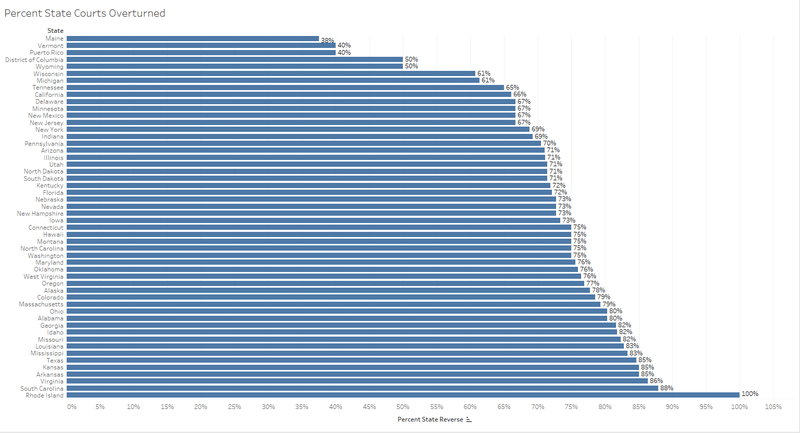 The largest share of cases that the Court heard after a state court in a term was 42% while the smallest was 7%. Another element of interest is how favorably the Court has treated decisions from the various state courts. The following figure looks at the rate with which the Court has overturned decisions from the various states’ courts. The Court reversed fewer than 50% of the cases from only three states – Maine, Vermont, and (although a territory, treated as a state for the purpose of this analysis) Puerto Rico. On the other end of the spectrum the Court overturned all four cases it heard from Rhode Island courts. The Court has also overturned over 60% of cases from both the California and New York courts. Another way to look at state involvement in the Supreme Court is through instances where states themselves are direct parties in to Supreme Court cases. While the distribution mostly parallels that of the cases from state courts these two sets of cases are far from identical (state government attorneys, for instance, participate in many cases that do not involve the state as a party). The following figure graphically presents states’ relative participation as parties in Supreme Court litigation since 1946. As with the state court distribution, California is the leader in terms of party participation. Several states in the northeast are regular participants before the Court although none as frequent as California. Texas and Florida are also darker shades than many other states equating to a greater level of participation. States have not participated in the Supreme Court at a static rate over time though. 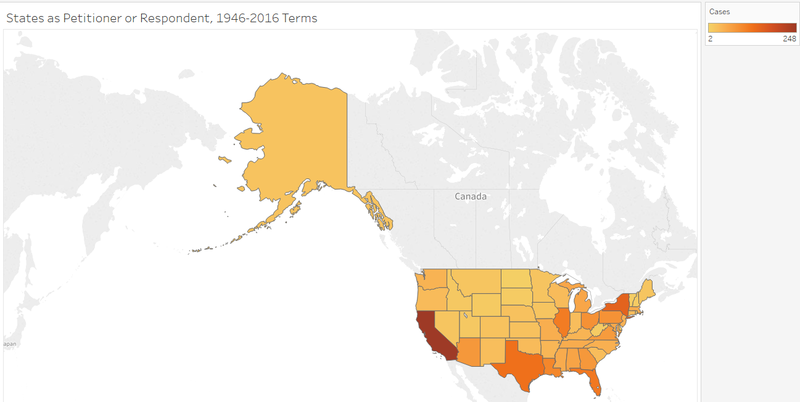 Looking at four of the most regular participants – Florida, Texas, New York, and California – we can see the changes in their Supreme Court litigation over time. California was not always the most active participant of the bunch. New York took this most active position during several of the Warren Court years. Florida has had several terms where it was the most active state of the four before the Supreme Court. Texas has remained consistent in its participation at a rate generally below those of both California and New York. Of course, along with participation, another way to look at involvement in Supreme Court litigation is through relative success. The first way to do this is by viewing the absolute numbers of wins and losses for states both as petitioners and respondents before the Supreme Court. 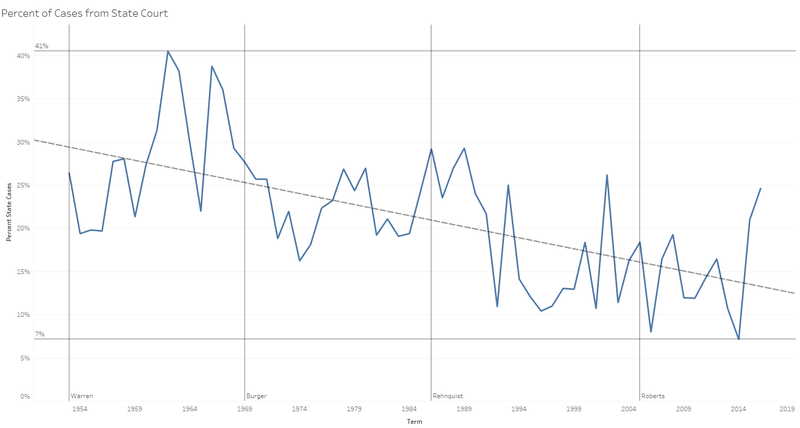 The following figures, beginning with the petitioners’ figure, use data from the 1946 through 2016 terms. 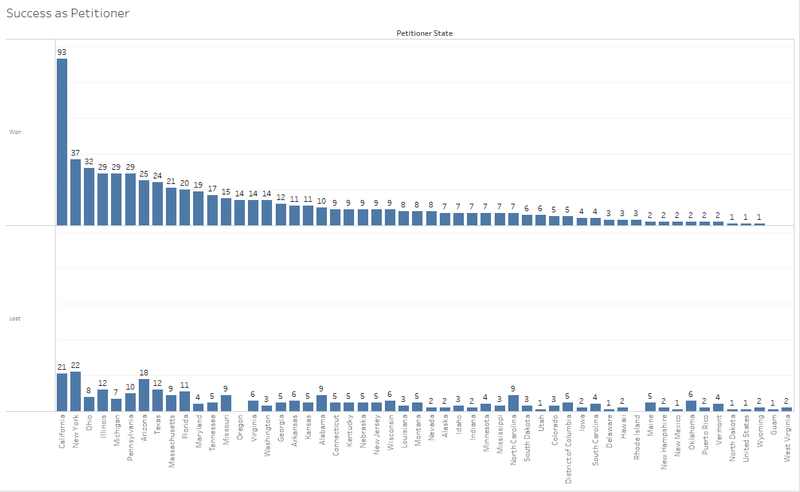 California is by far the most dominant petitioner state both in terms of wins and overall cases. 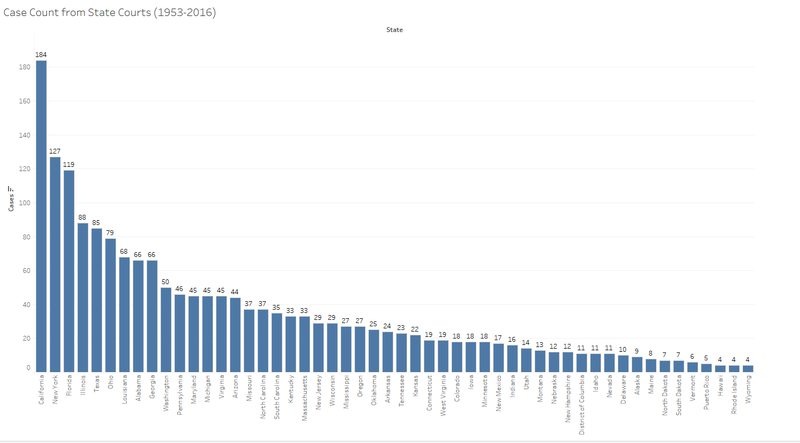 New York has the second most wins with less than half as many as California. The only state with five or more cases on the petitioner list and zero losses is Oregon. 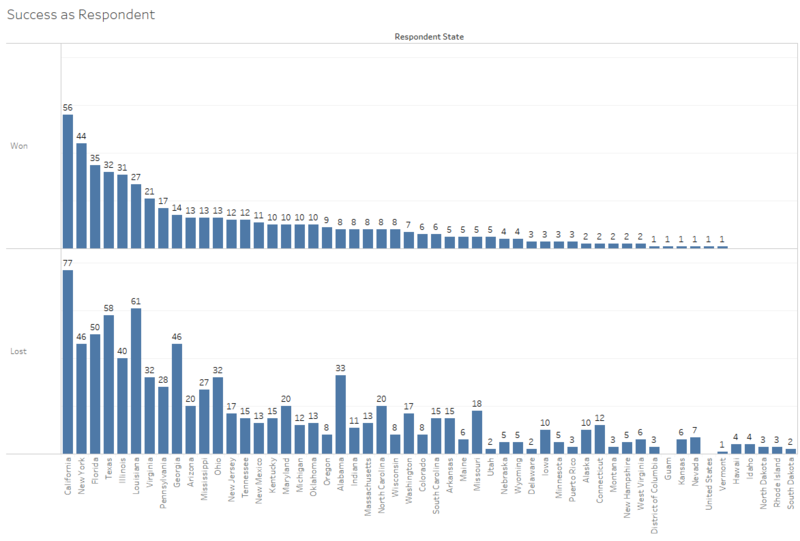 States, however, are more often respondents in the Supreme Court. This is primarily due to criminal procedure related cases, which compose almost 50% of the case types where states are respondents. 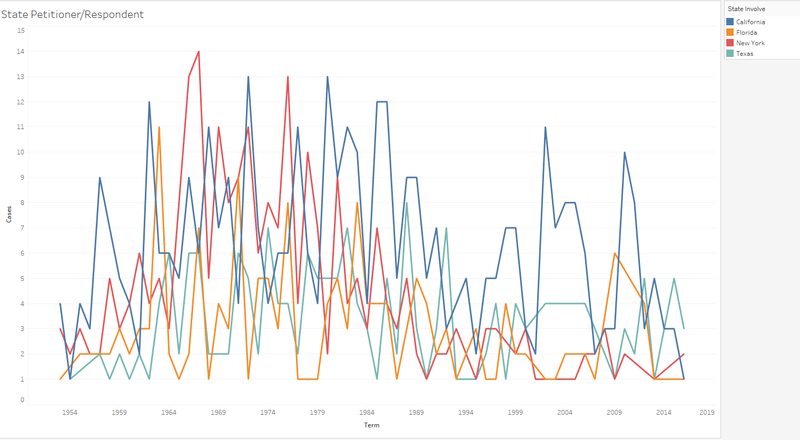 The following figure tracks states’ wins and losses as respondent parties before the Supreme Court since 1946. As a respondent, California both won and lost more cases than any of the other states. New York’s relative success as respondent is a little stronger than California’s while Texas lost more cases as respondent than it won. The final figure breaks these states’ wins and losses into overall success rates. The average state success rate is just over 40%. In other words states lost more cases than they won. 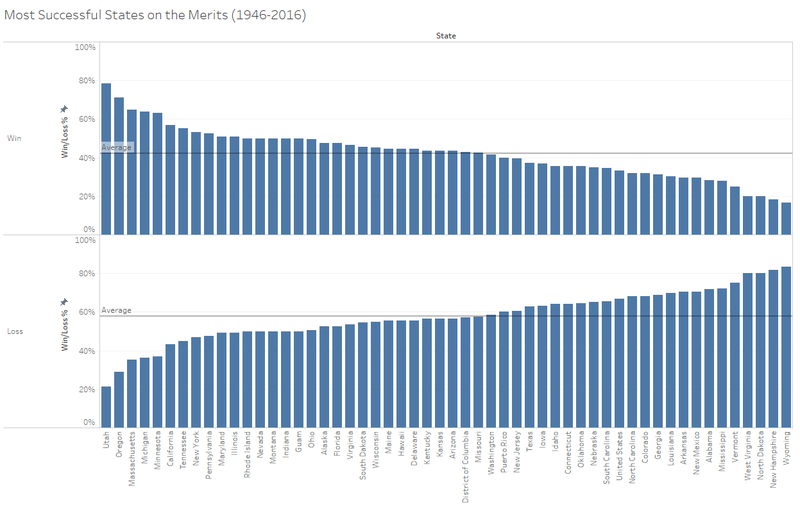 Since states are most often respondents on the merits though, and the justices decide for petitioners in 60% or more of the cases they hear, this average winning percentage is to be expected. Utah has the highest winning percentage at just under 80% followed by Oregon and Massachusetts. While both at the high end of the spectrum, New York and California lost more than 50% of the cases where they were parties on the merits. Texas lost more than 60% of the cases where it was a party on the merits and at this rate was just below the average winning percentage. While cases from state courts make up a smaller share of the Supreme Court’s docket than they did in the past, certain cases from state courts including Masterpiece Cakeshop are tracked by large numbers of court watchers. Furthermore, attorneys on behalf of several states including Texas and California will likely continue to be regular participants before the Supreme Court. Certain attorneys like Scott Keller and Eric Murphy have had as much experience before the Supreme Court as some of the more experienced repeat players from private practice and have developed corresponding reputations for their expertise. If states win big name cases like Masterpiece Cakeshop, they their statuses as formidable parties before the Supreme Court that can hold their own against any other party, firm, and attorney with significant Supreme Court expertise will only be amplified.